Clear template cache from the CLI? I was looking for a way to clear the “template caches” and “compiled templates” from the CLI, as I want to automatically do this after every auto-deploy of the site I've created. For this I was looking into the craft binary and its cache/list command. However, when running ./craft cache/list it only returns me cache (yii\caching\FileCache). So hereby I'm wondering if it's possible to clear any of these caches show above from the CLI. Or is the cache/clear command for something else that I'm not aware of? As for cache/clear this clear's Yii2's cache... which Craft CMS uses for almost nothing. Template Caches are always in the db, compiled templates are always cached on disk as files, and so on. Thanks for contributing an answer to Craft CMS Stack Exchange! Not the answer you're looking for? Browse other questions tagged craft3 cache cli or ask your own question. Cache invalidation to automatically update all cached template content? Is there a way to override the template caching system? 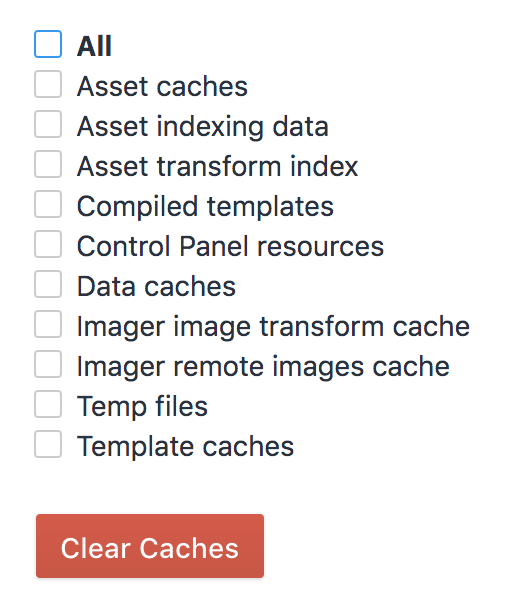 Is it possible to clear caches and re-index assets programattically? How can I bust a template cached plugin variable in a loop? What are my caching options when using CraftQL and React?